"I feel personally attacked by this game." "THERES JUST A LOT GOING ON HERE. OMG ITS GROWING"
"This game was agony but in a good way. 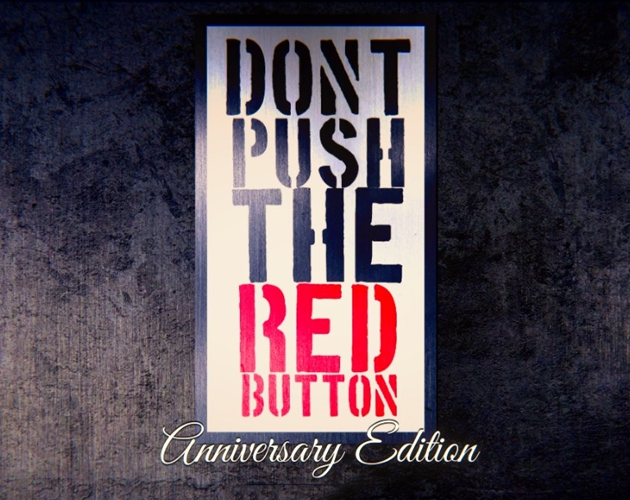 10/10"
After one year of button pushing, Cercle Games is proud to present: Don't Push The Red Button: Anniversary Edition! Online Leaderboard - Compete to not push the button longer than anyone else! And a specially made VR version for use with the Vive or Oculus Rift! Please follow Cercle for updates on future projects! 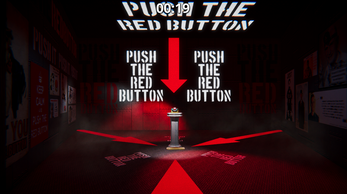 Anniversary Edition of Don't Push The Red Button!! I had to push the bottom to play other games!!! It is extremely easy to cheat at, since the goal is to NOT press the button. You can just play a different game, while leaving this one up and running. Therefore, you should make it so you can't be away for a certain length of time in order to maintain fairness. So... you people are absolute torture. Even though this was hilariously made, and I played it, it was still absolute torture. Love how the download button is red, too. Took a look at this game...Decided to make a pointless 3 minute part of this game on a 3 free game video...Shocked someone kept their game app. opened for soooo long! Well! If you want to check it out. I put mine in part 3 of the video here! July 26th, 2018 will mark one full, amazing, rich, beautiful, glorious, painstakingly long year of people playing a game where they don't push a red button. As everyone knows, this game has gone down as one of the most important events in human history. 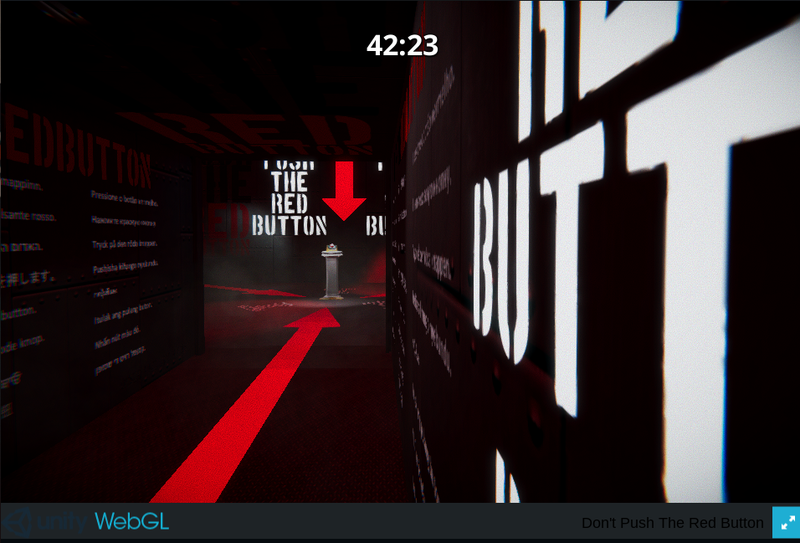 The Red Button was nominated for a Pulitzer prize in February, was considered for the MacAuthur Genius Grant, and History courses at Yale and Harvard have started teaching Red Button 101 classes. In fact, UCLA will now offer a prestigious MBA in the Red Button Arts this Fall. My God, what an astounding time to be alive. The unshaven team at Cercle has been working day and night and day, furiously typing algorithms into our coffees and downing cup after cup of delicious computer, all in the desperate attempt to complete "Don't Push The Red Button: Anniversary Edition" before the 26th. We have been told by our accounting and law team that in order to distribute this experience to the widest audience we need to ask for a certain amount of a newly discovered resource called: "Money." 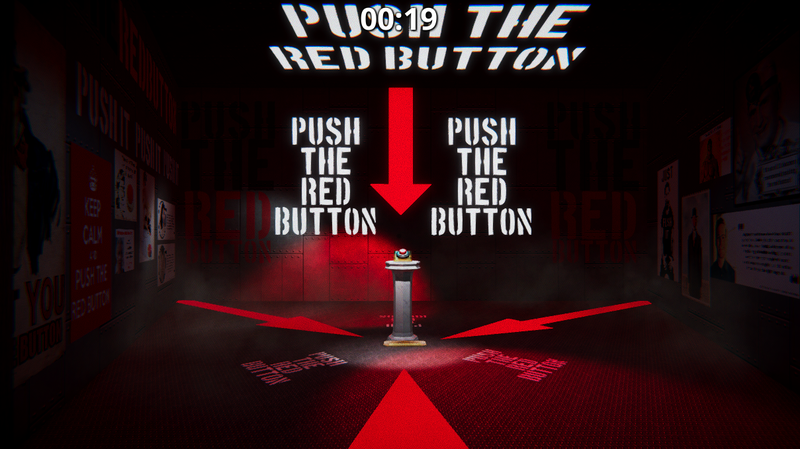 If we receive enough of this so-called "money," we will be able to get "Don't Push the Red Button: Anniversary Edition" in front of the eyes of the world. And then, everyone, yes, EVERYONE, will know the glory of the red button and will quake in its presence. 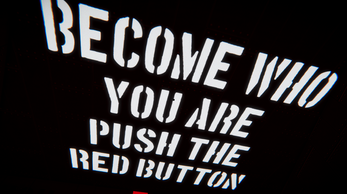 TL;DR: I'm asking for money to finish and put Don't Push the Red Button on STEAM. And anyone who donates will get their name in the credits of the game. why does this game even exist its so mean!!!!!!!!!!!!!!!!!!!!!!!!!!!!!!!!!!!!!!!!!!! bad gayme!!!!! it maked me sad when i touch it. called me total n00b but i touch it! it told me to! so i retry and dont press and it was trying make me die so i had to click and it said i lost again game so bad and mean!!!!!!!!!!!!!!!!!!!!!!!!!!!! average mind of a 5yr old. I thought you were actually serious XD. My arms are longer than existence itself. ok so on the wall on the start with all the other languages you put some hebrew text (probably with google translate) 2 times. 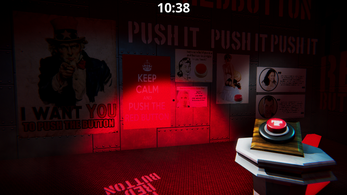 one of them was just random letters and the other was a nice try of saying "push the red button" in hebrew. the problem is that you got the grammer all wrong! Thank you for the heads up! I've had so many people point it out to me since markiplier's video and it is fixed in the newest version which comes out later this month! Sorry about that! You got it! Thank you for your help! Olen täysin samaa mieltä ja vilpittömästi anteeksi. Suomi on ihana maa ja ansaitsee paikkansa seinälle. I had another person tell me recently and it will be fixed in the next version! I'd like to invite you to take part in this year's Game Development World Championship! This is a pretty fun game it's a simple and doesn't take itself seriously, but it's still well made. You actually get some time passed by just reading all the stuff on the walls. My only complaint is that the mouse aim was a bit wonky in the browser version, I had to aim on floor to finally press the button. Awesome game and nice way to keep people engaged in the small game environment! can you send me a link to that girl sitting on a blue stool? It doesn't work, just a blank black screen. Where did you get the soundtrack? SINGS ALONG "Puuuuuush the red buuuuuuuutoooooooon. Puuuuuuush. The. Red Buuuuuuutooooooon. Puuuuush theeee reed buuuutoooooon <keychange> PUUUUUSHH THEEE REEED BUUUUUUUTOOOOOOOOON...PU-USH..THE-EE-RED BUUUUUUUUUU. TOOOOONNN..."
I got to 42:23 and the game froze so I count that as a win. You found it!!! Under Five get a Prize! Sorry for the freeze! I'll officially go ahead and say that you won. This was pretty fun but I couldn't hold out too long. This game is.. WOW. Patience truly is a virtue, one of which we don't have late at night recording. 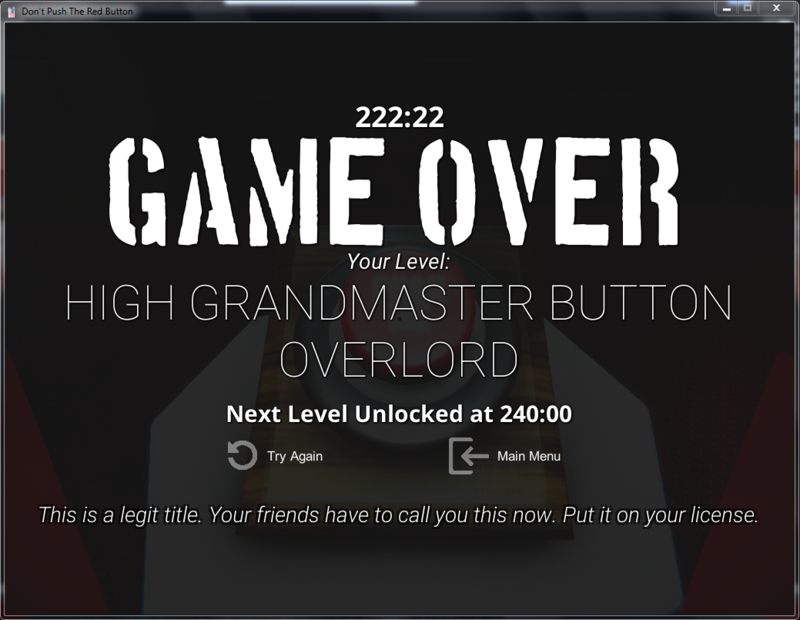 We managed to get to black belt level, and am curious as to what happens when you wait the entire time. Here's a video of us goofing off and our reactions, though!